The Every Student Succeeds Act (ESSA) provided an opportunity for states to rethink their accountability systems and redesign them to emphasize multiple measures of student and school performance, including academic achievement, student growth, graduation rates, improving the English language proficiency of English learners, and other indicators of school quality and student success. States took different approaches to developing their state plans under ESSA. Many states took the opportunity to develop a new vision and strategy for their education systems and designed an accountability system to incent improved student outcomes. Other states approached the development of a state ESSA plan as an exercise to meet new federal requirements for their accountability systems. This series of briefs analyzes states’ widely-varying approaches to long-term goal setting around graduation rates and academic achievement, science and STEM education, inclusion of on-track to graduate measures, and – coming soon – college and career readiness measures in their accountability systems. For a more detailed look at all components of each state’s accountability plan as submitted under ESSA, and to compare two states’ plans, take a look at our online tracker. Details on each state’s long-term goals can be viewed in the goals tracker. 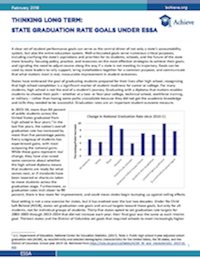 This brief examines long-term goals for improving graduation rates included in states’ submitted ESSA plans as of January 2018, and offers early insights into the varied approaches states have taken in setting long-term goals, and the timelines and trajectories to reach them. 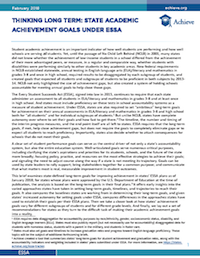 This brief examines state-defined long-term goals for improving achievement in states’ ESSA plans as of January 2018, and offers early insights into the varied approaches states have taken in setting long-term goals, timelines, and trajectories to reach their goals. 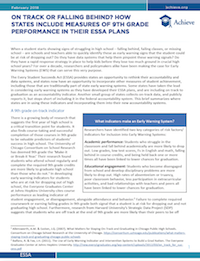 This brief summarizes where states are in using early warning systems, including an indicator of whether students are on track to graduate, and incorporating them into their new accountability systems. This brief provides a landscape analysis of all states’ current assessment requirements and graduation requirements in science to help set the national policy context for science. Originally published in July 2017, this brief limited its scope to the 16 states and the District of Columbia who submitted plans in the first round of submissions; it will be updated to include all state plans soon. 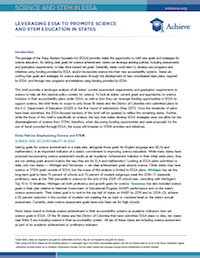 This brief, a collaboration between Achieve and UnidosUS, provides a two-part analysis of states' goals for English learners (ELs) in ESSA plans. First, it examines states' academic achievement goals for English language arts (ELA) and mathematics for ELs, and how those relate to the rigor of targets states are setting for other student groups. Next, it presents an analysis of the EL proficiency goals proposed in ESSA plans, and provides a closer look at how states are proposing to assess strides in English language proficiency for ELs. Under ESSA, states are now required to develop an English language proficiency (ELP) indicator that must be included in the statewide accountability system and must apply to all schools and districts. This brief, a collaboration between Achieve and UnidosUS, examines how states are including the ELP indicator in their statewide accountability systems.